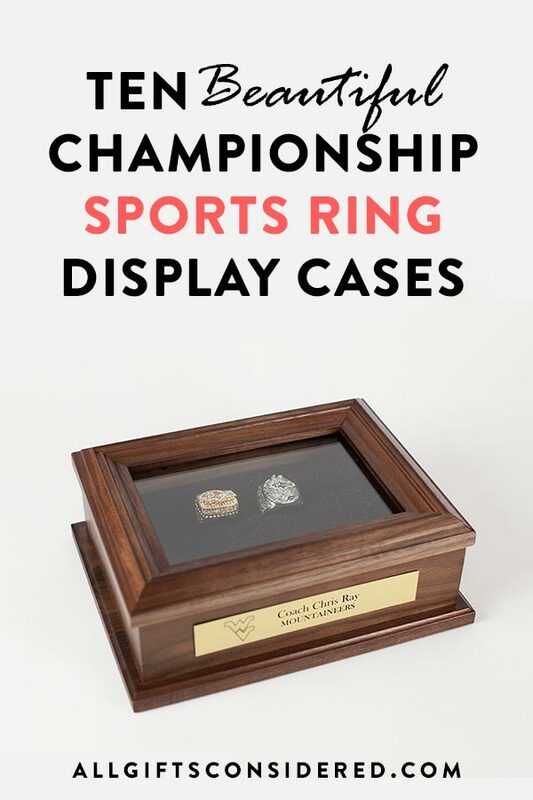 As you browse through the available options for championship ring display cases, you’ll want to take things like quality, price, material, personalization, and number of rings into account. I want to point these out because the first item on our list is quite the exception. Basically, I’m going to brag on our championship ring display case, which really does stand apart from the competition. First, most displays are made from a veneer – in other words, fake wood. These are relatively inexpensive and have a nice look, but it’s just not the same quality as a display case crafted from real wood. There are tons of veneer boxes with an acrylic top, or veneer bases with an acrylic cover. 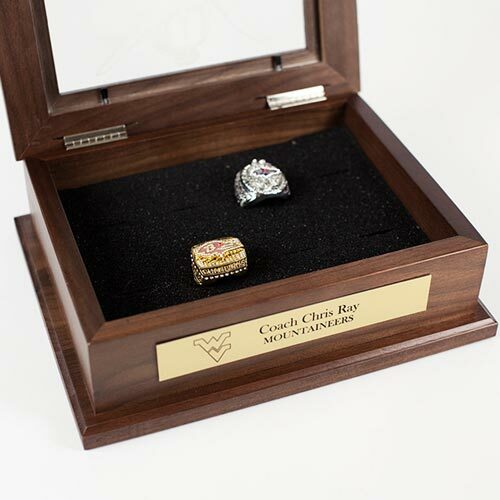 Our championship ring box (#1, below) stands out because it is solid walnut wood with a real glass lid. Second, most cases come in a few configurations for 1-8 rings. If you want more slots, the options get slimmer. Our championship ring box stands out here, too, because you have the option for 1-20 rings, or you can even cut the slots yourself to try and fit more rings or a combination with other items (say, a golf ball). Third, most of the ring display cases below are imported. That’s fine, but there is a difference in quality between something that is bulk manufactured overseas and something with genuine craftsmanship. Our championship ring display case is made in the USA from real wood. Fourth, some cases can be personalized with custom laser engraving. Others don’t have that option, or tack it on as an additional cost. Ours includes custom engraving on the front name plate, PLUS we can (optionally) engrave the glass lid for further personalization. We can engrave your school/team logo as well! Finally, there is the matter of price. While some of the items you can find will be inexpensive, that may or may not mean cheap. For instance, the little acrylic cubes that hold one ring are about seven to ten bucks. As long as you are expecting a simple acrylic case, that is a great deal. Other displays can go up to $100 or more depending on the product. Most of the popular best-sellers are $30-60. Our championship ring box is surprisingly competitive here. For the number of rings you can hold (up to 20) and with personalization included, it’s right around average at about a hundred bucks. Throw in the real wood, real glass, and American-made quality, well, it’s tough to beat. Ok, enough bragging on our display. Let’s take a look at it, plus 9 other beautiful championship ring display cases. This is it. 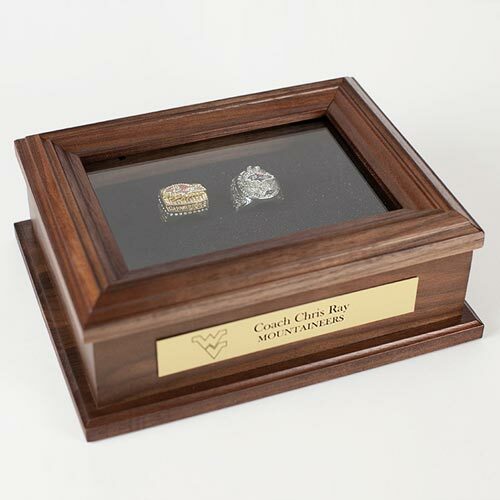 Like we said above, this is a solid walnut wood championship ring display case made in the USA with a genuine glass lid. We will cut the foam insert that holds the rings to order for you, so you can specify any number between 1 and 20 rings (or cut it yourself, it’s easy). In addition to the premium quality, you also get a custom engraved name plate that can include 2-3 lines of text and even your school or team logo. For further personalization, you can opt to engrave the glass lid as well. Most people prefer to keep the lid clear to show off the rings, but we do quite a few with a quote or logo in the center, or a uniform number set off to one of the corners. 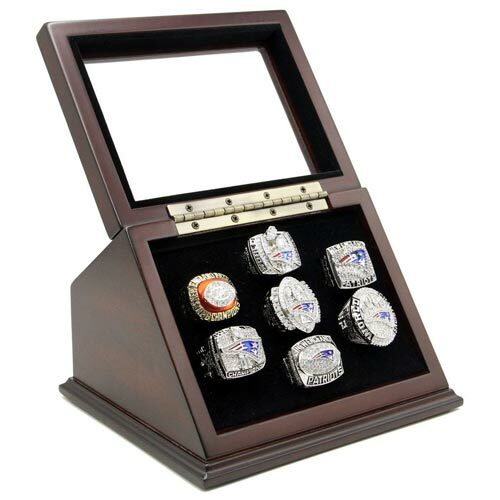 This sophisticated little championship ring display case holds five rings and comes with a dark mahogany finish. The lid opens on smooth hinges, with a clear acrylic viewing window so you can display the rings while keeping them dust-free. Optionally, you can choose to add a small name plate in gold or silver inside the box. This plate can be personalized with up to four brief lines of text. 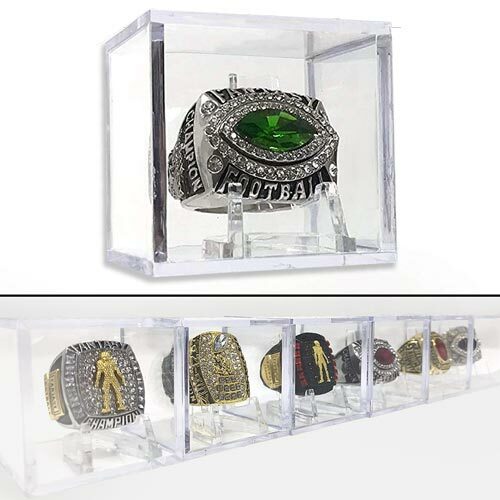 This championship ring display case is the perfect combination of elegance and affordability when showcasing a single ring. Customize the front plate with up to three lines of personalized text in white (to match silver rings) or gold (for gold rings). An acrylic cover protects and preserves the ring from dust and other elements. The black pedestal base and clear ring holder work seamlessly to give a sense of weightiness to the piece. 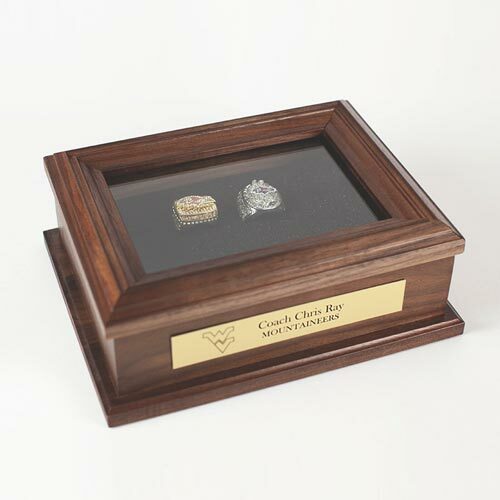 Overall, this case is a great way to display a single sports ring without breaking the bank. The slanted front sports ring display case is a unique design, perfectly suited to help you showcase your ring collection. 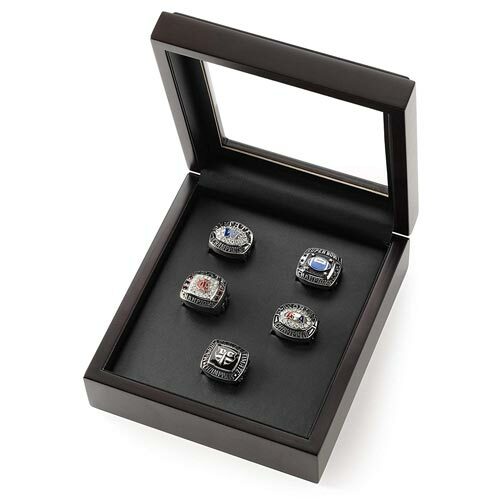 Made from heavy, durable materials, the tilted arrangement displays your championship rings clearly and effectively. The box holds up to seven rings, and features a hinged lid with clear acrylic display window and a cherry veneer finish. For a single ring, this clear acrylic ring case is the ultimate combination of simplicity, utility, and affordability. They cost less than ten bucks per ring. You can start with one display for a single ring and just get more as your championship ring collection expands. These display cases are stackable, and allow you to mix, match, sort, and have an all-around view of each ring. Great for portability and trading. Plus the seller tends to bundle them at even cheaper prices for multiple quantities. This ceremonial championship ring display case features ten distinct pedestals of various heights which display up to 10 collectible sports rings. 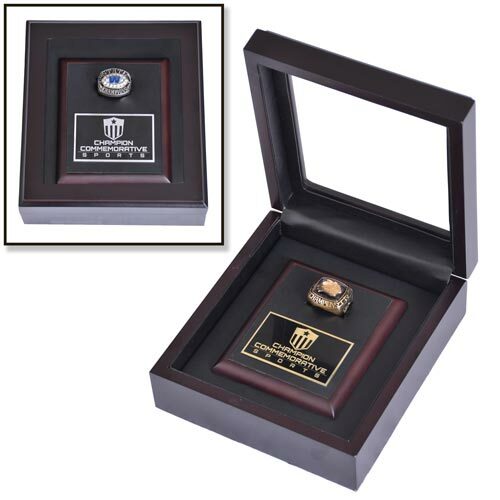 Here we have a great choice to display a single championship ring in an elegant little personalized box. It’s the same sort of box as some of these others – imported, dark mahogany veneer, hinged lid, acrylic window, etc. 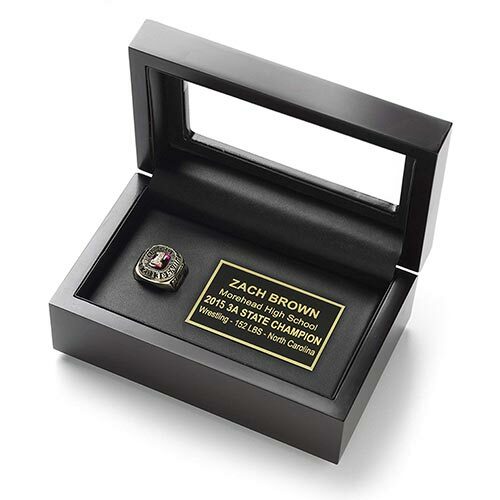 What sets this championship ring display apart, however, is the simple and elegant arrangement of the name plate and ring together in the small but not-too-small decorative box. It’s a classy way to show off a special ring, together with a description of what makes the ring so special. This championship ring box also holds a single sports ring, but with a sophisticated variation. Inside the box the ring and custom engraved name plate are set apart on a slightly raised wood plate. This gives the piece a sense of poignant class. Other features include free customization, choice of silver/gold engraving to match your ring, hinged lid with clear acrylic window, wooden frame, and dark mahogany finish. 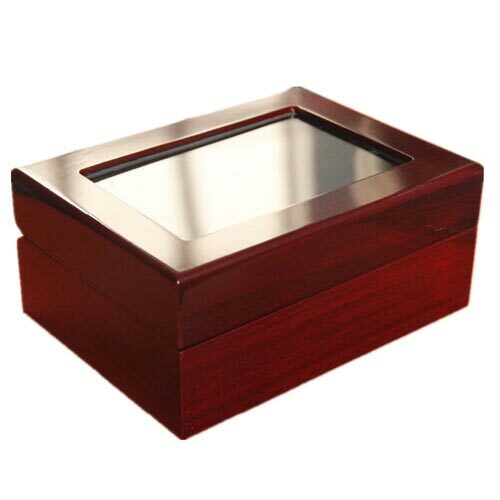 This elegant wood ring display box features a rich cherry finish and includes a sturdy top-opening hinged lid with viewing window. You can choose the size with inserts for 1-7 or 12 rings to accommodate your collection. 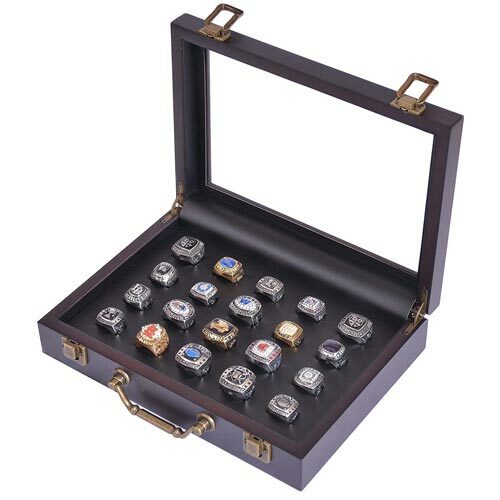 Here is a lovely dark mahogany championship ring case that can display 20 rings. The hinged acrylic viewing window closes with clasps, and the front features a matching handle that gives the display a very classy look. It’s a good quality import, not real wood but the veneer is excellent. The bronze handle, latches, and matching hinges are the real selling point for this ring display box. 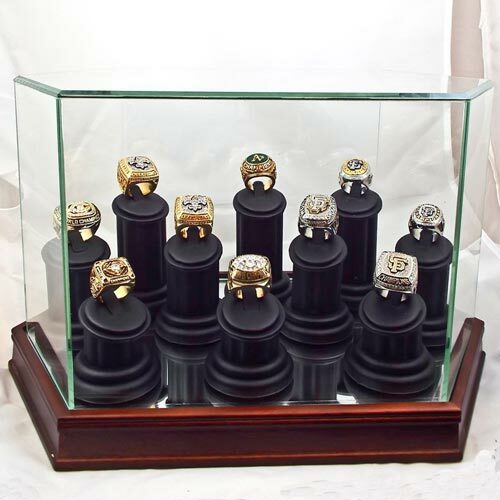 There you have it – ten beautiful championship ring display cases! Be sure to check out our #1 best ring display box here, and check out the rest of our Northwest Gifts store for some of the most creative and unique personalized gift ideas!